I’ll admit it, I have both loved and hated Hood River. I’ve been here so long, since birth actually, that I feel like a part of its history. I remember when partial lengths of the main road leading up town had no sidewalks. I remember when our first McDonalds moved in down on the port and when there was nothing but fields in what is now the west end of town. As I grew up in The Hood River Valley I just dimly remember the slow change from a child, happy and unconcerned, to a smothered teenager, antsy to get away and see the world. I itched to get away from the all too familiar faces and sleepy streets. There was more…something better out there, right? In the years since high school I’ve left and come back, left and come back, and now back again, I’ve yet again found new love for this now not so sleepy town. Since the golden age (everyone gets to refer to their childhood as the golden age) the sidewalks have all been paved, the windsurfers have moved in and the world of tourism has discovered us. And yet, today I discovered that even with two McDonalds, a Taco Bell, Dairy Queen, Wal-Mart and two, yes two, grocery stores we have not stumbled too far from our small town roots. Hood River was created by pioneers, orchardists and the lumber industry. At its height, the Hood River Valley boasted more then 14,000 acres of orchards. In the beginning it was mostly apples, but today its pears. And boy, do we do pears. Hood River County produces more pears than any other county in the United States. 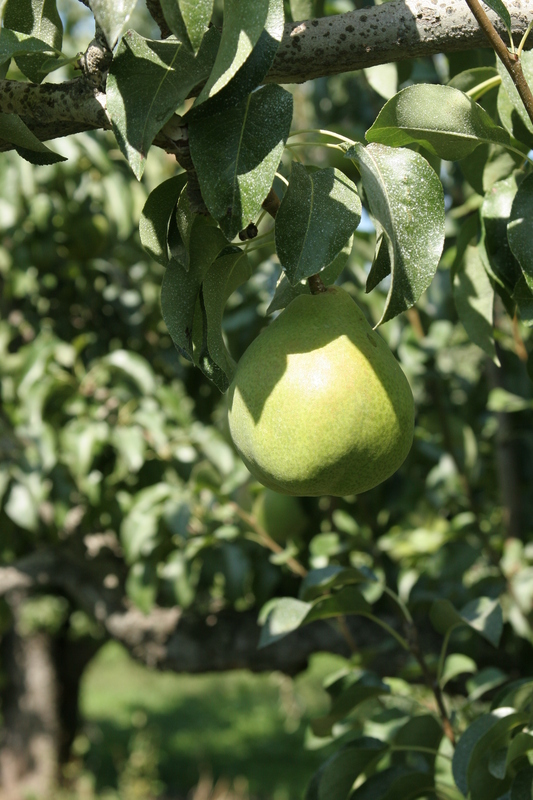 Our pears go to over 40 countries around the world, and we (Oregon as a whole) rank #2 in the nation in pear production. In fact, Oregon pears, laid end to end, would wrap around the Earth twice. Now that’s cause for applause! Maybe it seems silly to get so excited about a bunch of pear trees, but I look at it like this: We make something that is juicy, sweet, healthy and delicious. In a society full of processed foods and bleached sugars we spread health, one tasty perfect pear at a time. They’re great snacks, make a wonderful dessert and add a healthy fiber-potassium-vitamin C punch to your diet. When it comes to pears, there’s nothing to not love. So, feeling like a Webster Comice Pear? Springtime in the Hood River Valley, Ore.